"It was a total team effort," Harden said. Harden, who leads the NBA with 36.2 points a game, was asked if it's a relief to not have to carry the offense every night now that stars such as Clint Capela and Chris Paul have returned from extended absences. "Yeah," he said. "I just take what the defense gives me. Making shots or missing shots, I'll take the same shots every single game ... and I got off the ball and multiple guys got open shots. I don't really try to press anything. I just try to take what they give me and be effective." "For him to come in here and compete at this stage without a lot of his guys out there on the floor says a lot about his character and who he is as a person and as a leader," Charlotte coach James Borrego said. Coach Mike D'Antoni was a bit disappointed that his team let Charlotte get back in it after building such a huge lead. "Maybe it's a new reality and maybe players need to get used to that — that you can't take your foot off the pedal," D'Antoni said. A three-point play by Walker cut the lead to 10 with about 3 1/2 minutes left. But a 7-2 spurt by Houston, highlighted by a dunk from Kenneth Faried, made it 116-101 with about 90 seconds left and Houston's starters went to the bench. "I'm not a big fan of moral victories, but hopefully we can build off this, especially as far as our energy and our passion," he said. Rockets: Faried had 16 points and nine rebounds in his return after sitting out five games with a hip injury. He has scored at least 10 points in 16 of his 17 games with Houston. ... It was Houston's 11th game this season with at least 70 points in the first half. The Rockets have held their opponents to 97.8 points in the last five games after allowing each of their previous six opponents to score 110 points or more. 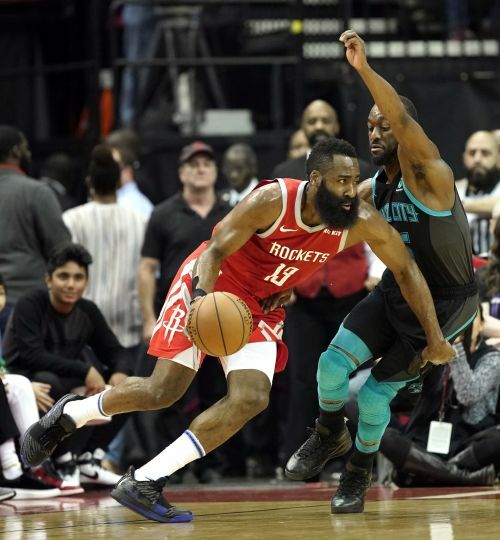 Charlotte shot just 42.7 percent on Monday for Houston's fourth straight game where it held a team to less than 45 percent shooting.